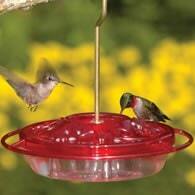 Looking for A Hummingbird Feeder For A Humming Bird Lover? 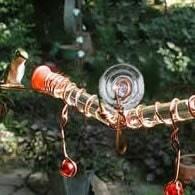 Are you seaching for the perfect Hummingbird Feeder Idea? Well, look no more. We've gathered some of the most popular types offered today. 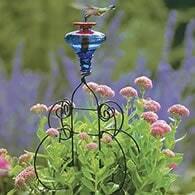 Sure to please all those who enjoy attracting and feeding our tiniest winged wonder, the Humming Bird. 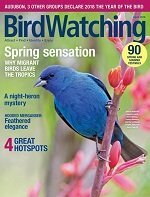 The types below are sure to please both you and the hummingbirds. Built to last so that you enjoy your hummers season after season. 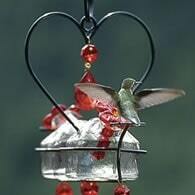 We invite you to consider these proven hummingbird feeders for attracting hummers to visit your yard. Most people do not attract 100's of these birds. 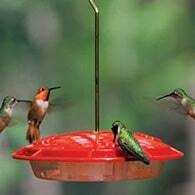 You add only the amount your hummers eat between cleanings. Your sugar water solution will last longer in the refrigerator than in the hot sun, causing less waste. Cleaning needs to be done no less than once a week. Consider the window mount for shut-ins and children. 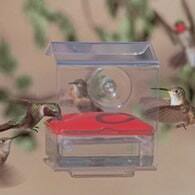 They'll love you for showing how much you care, and think of you everytime the humming birds show up. 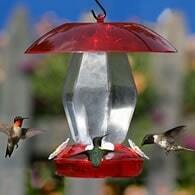 Offering artificial nectar for hummingbirds can make the difference between living and dying. Sounds a little over the top doesn't it. Think about this, last season about a third of the south had their worst drought in years. 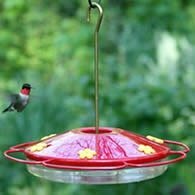 During these times native plants are not blooming and producing nectar for the hummingbirds. 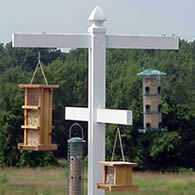 Your feeder may be the only thing or at the least, one of very few food sources available. Considering they may be crossing the Gulf of Mexico to get to their wintering grounds. The amount of weight they have to put on is considerable. 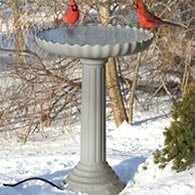 Without you providing food for hummingbirds, that crossing may not be completed. Don't worry that you'll be keeping them here longer than they should be. That just won't happen, but it means they'll migrate whether they are physically strong enough or not. So that's the reason you should keep feeding them as long as they are around. 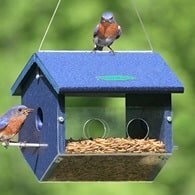 We would like to thank you for your purchase as it lets us know you care about our birds. Thank you very much.